The parish of Tibenham is situated in the south of Norfolk. It lies west of Aslacton, south of Bunwell and Carleton Rode, east of Banham and north of Diss and Gissing. The name Tibenham may derive from the Old English meaning ‘Tibba’s homestead’. The parish has a long history and was well established by the time of the Norman Conquest. Its population, land ownership and productive resources were detailed in the Domesday Book of 1086. This document revealed that the lands were part of Roger Bigot’s holdings and that the parish possessed woodland and a mill. The earliest evidence for human occupation in Tibenham takes the form of prehistoric flint pot boilers (NHER 17869), which were used by the early inhabitants to heat water probably for domestic purposes. Indeed, flint tools form the mainstay of the prehistoric assemblage. A Mesolithic or Neolithic flint blade (NHER 17868) has been found along with two Neolithic flint laurel leaves, although the purpose of the latter tool type is unknown (NHER 17869 and 34385). 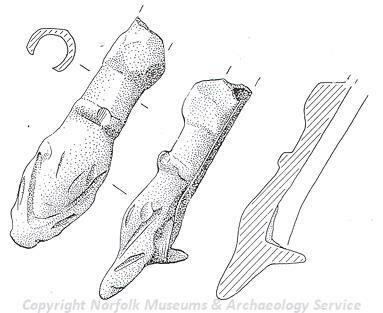 Other flint objects have been dated to the Neolithic/Bronze Age transition period, and these comprise an arrowhead (NHER 17868), scrapers and flakes (both NHER 28632). The Bronze Age saw the advent of metal objects. In Tibenham a copper alloy spearhead (NHER 17828) and palstave (NHER 10922) are a testament to this new technology. Compared to the other periods of prehistory, fewer Iron Age items have been discovered. A selection of those that have been reported include a fantail brooch produced during the Late Iron Age/Early Roman period (NHER 17868), a coin minted by the Durotrigan tribe (NHER 38102) and assorted pottery sherds (e.g. NHER 28632). To date, no Roman sites have been found in Tibenham. The majority of finds from this era comprise pottery sherds (NHER 10923 and 15464) and brooches (e.g. NHER 28632). Brooch types found include a Hod Hill type (NHER 17388) and disc type (NHER 17866). Other finds include a lead steelyard weight (NHER 35680) and a finger ring (NHER 28632). The scenario is the same for the Saxon period. No sites have been discovered but metal detectorists have recovered various objects. The finest of these are a Middle/Late Saxon Ringerike strap end and 10th century Anglo Scandinavian bead or pin head (NHER 28632). Several of the other finds date to the Middle Saxon period, and these consist of a pin (NHER 17867), sceatta (NHER 17868) and a stylus (NHER 28632). The most obvious medieval monument is All Saints’ Church (NHER 10935). This church has a mixture of Decorated and Perpendicular fittings, but some of the earliest features are Norman in date. The tall west tower has flushwork and battlements. All Saints’ once had an associated chapel dedicated to St Mary, and although the ruins of it were visible in the 18th century nothing now remains. Additionally, many of the timber-framed residential properties in the parish have origins as medieval hall houses. Examples include Dyson’s Farm (NHER 19947), which retains its original upper floor, Manor Farm House (NHER 25293), which houses an unusual wooden screen and Low Farm (NHER 39841), a building most notable for its grand and ornate parlour block. These are to mention but a few, as there are many other buildings that could potentially have medieval cores. There is no surviving medieval manor house in Tibenham. Chanons/Channonz Hall (NHER 10937) sits inside a medieval double moat and derives its name from the owner of the manor in the 13th century. However the present building is part of a larger E-shaped house, dated 1569, which was modernised in 1721 and partly demolished in 1784. Other possible hall sites have been identified from moated enclosures visible on aerial photographs (NHER 10936 and 11903). Indeed, one of these moated features (NHER 11903) was associated with the manor of West Hall on the Enclosure Award Map of 1820. Another building that would have been present in medieval Tibenham is a Guildhall (NHER 20544). The exact site of this building is unknown, but it was used by the three parish guilds who met in the church and adjacent chapel. In contrast aerial photographs do show the location of medieval agricultural features like strip fields (NHER 19723) and ridge and furrow (NHER 11903). A wealth of medieval artefacts has been recovered from Tibenham. This diverse collection of objects includes a number of fine pieces such as an enamelled copper alloy plate (NHER 17388), a gilded horse harness pendant (NHER 17869), a strap end with niello inlay (NHER 17869) and a superb annular brooch (NHER 28632). Other more mundane finds comprise an iron horseshoe (NHER 44774), a seal matrix (NHER 48968), a bronze vessel escutcheon (NHER 28632) and various pottery sherds (e.g. NHER 10924 and 12718). The post medieval period in the parish seems to have been particularly busy. A large number of houses, farmhouses and barns were built and most survive into modernity. As a consequence, it is only possible to mention a selection of them here. Old Hall (NHER 10035) is of interest because it is good example of a typical 17th century Norfolk farmhouse and is rumoured to stand upon the site of a medieval chapel. Brook Cottage (NHER 34272) is notable for its unusually late use of clay lump as a construction material while Hastings Hall (NHER 45552), with its fine jettied first floor, was once known as the ‘Poor House’ and this perhaps hints at a past use for the building. A set of genuine poorhouses can be seen by visiting 1-4 The Almshouses (NHER 41956) on Church Street. This row of neatly arranged, single storey almshouses date to 1846. Lastly, Rosemary/Well Cottage (NHER 40448) is of interest because it is formed from two separate 18th century properties that have been amalgamated. Inside, there is a high-quality original staircase that is under a preservation order. Many other fine post medieval period buildings can be seen along Cargate Common (NHER 39841, 45555 and 48636), Low Road (NHER 45553 and 45554) and Church Street (NHER 45880, 48361 and 48635). One of the only non-residential buildings on record is a mill that stood behind Mill Cottage to the west of Tibenham village. Further research shows that a postmill at this site was for sale in 1794 and that it was last used in 1883. A fairly limited selection of post medieval small finds have been recovered from Tibenham. The most notable objects include a cloth seal belonging to a dyer (NHER 17388), a rowel spur (NHER 39387), a double-looped buckle (NHER 17653) and part of a candlestick (NHER 17869). The most recent records relate to World War One and World War Two sites. The parish was home to a military airfield (NHER 13628) that was in operation between 1916-18. It was used as a landing ground and also as a base from which to launch anti-Zeppelin patrols. A separate airfield (NHER 23222), close to Chanons/Channonz Hall (NHER 10937) was established in 1941. It was first used as a base for the United States Army Air Force, then as a Ministry of Food depot and then again by the United States Army Air Force. It was closed in 1959 and has been used as a glider field since then. Thomas Sunley (NLA) 20 July 2007.